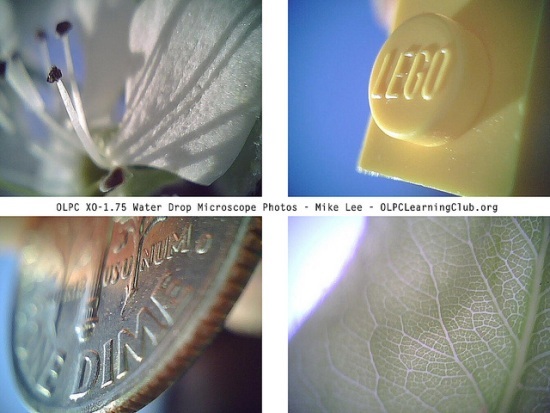 Bill Tuk of OLPC-SF emailed to tell me about how, for years, he has been using a drop of water over the OLPC XO laptop camera aperture to convert it into a microscope. The technique saw a resurgence recently when Scientific American blogged about insect photographer Alexander Wild, who put a water drop on the iPhone 4 camera to make macroscopic photos. His sample photos of a flower, ant and dime look incredible. Earlier today, with low expectations based on my past experiences with the low resolution, low contrast XO camera, I set an XO-1.75 beta machine (any XO laptop will work) with screen face up on my porch railing and dabbed a drop of tap water on the camera aperture window with a plastic drinking straw. The preview in the Record activity went completely blurry, but unlike most any other laptop, I was still able to clearly see the activity screen in the bright afternoon sunlight. I had some random objects from my yard and kitchen. Holding a yellow 1×2 Lego brick in my fingers, I hovered it over the water drop. The letters LEGO burst onto the screen from the sunlit brick. The quality of the image was excellent for an XO. Some of my shots are in the collage above and in an annotated set on Flickr. The clear plastic disc over the the XO camera is glued completely in place, so I just put my drop of water directly on without any problems. Even a small bottle of water will be enough to keep an entire class of XOs refreshed with water drops every 15 minutes for many hours of field exploration. The XO's daylight readable screen makes it easy for the children to share their photos and reflect on them by taking notes and making sketches. 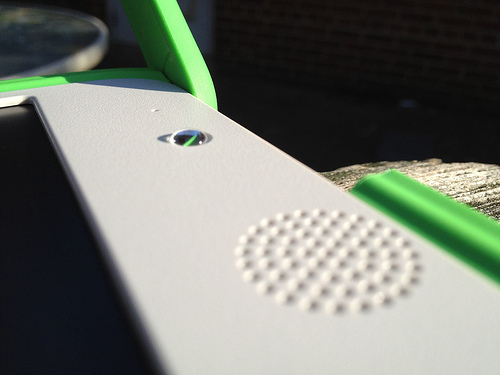 We're hoping that water drops on XO laptop cameras will inspire millions of young Van Leeuwenhoeks around the world. Bienvenidas las aplicaciones gratis o muy baratas y las inifitas aplicaciones futuras!